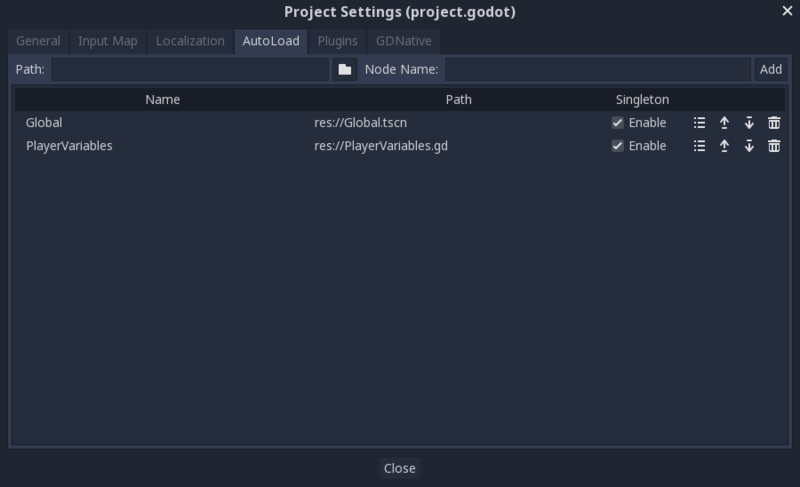 Godot’s scene system, while powerful and flexible, has a drawback: there is no method for storing information (e.g. a player’s score or inventory) that is needed by more than one scene. You can use a “master” scene that loads and unloads other scenes as its children. However, this means you can no longer run those scenes individually and expect them to work correctly. Information can be stored to disk in user:// and then loaded by scenes that require it, but frequently saving and loading data is cumbersome and may be slow. The Singleton Pattern is a useful tool for solving the common use case where you need to store persistent information between scenes. In our case it is possible re-use the same scene or class for multiple singletons, so long as they have different names. Autoloading nodes and scripts can give us these characteristics. 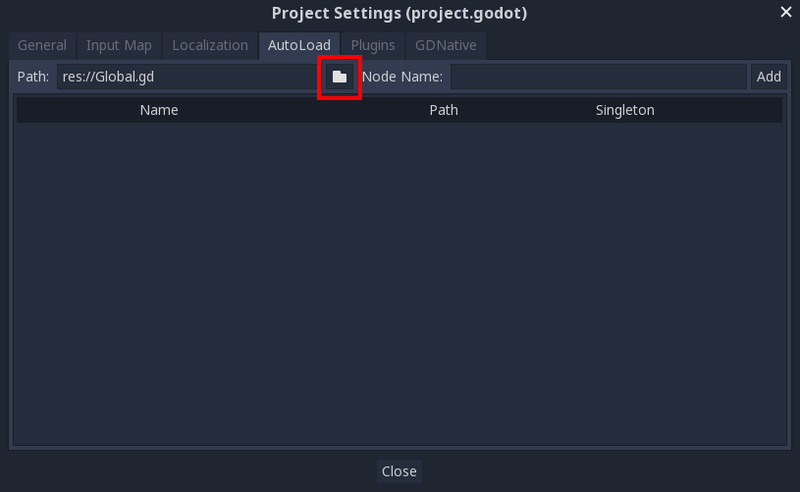 You can use AutoLoad to load a scene or a script that inherits from Node. Note: when autoloading a script, a Node will be created and the script will be attached to it. 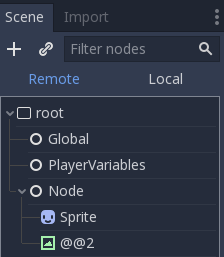 This node will be added to the root viewport before any other scenes are loaded. To autoload a scene or script, select Project -> Project Settings from the menu and switch to the “AutoLoad” tab. Here you can add any number of scenes or scripts. Each entry in the list requires a name, which is assigned as the node’s name property. The order of the entries as they are added to the global scene tree can be manipulated using the up/down arrow keys. playerVariables.Health -= 10; // Instance field. // Static members can be accessed by using the class name. This tutorial will demonstrate building a scene switcher using autoload. 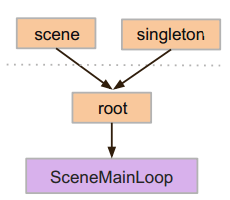 For basic scene switching, you can use the SceneTree.change_scene() method (see SceneTree for details). However, if you need more complex behavior when changing scenes, this method provides more functionality. 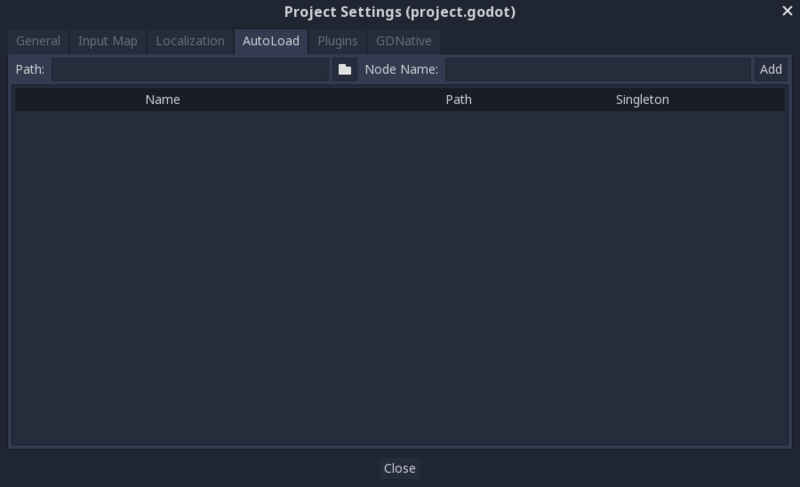 To begin, download the template from here: autoload.zip and open it in Godot. The project contains two scenes: Scene1.tscn and Scene2.tscn. Each scene contains a label displaying the scene name and a button with its pressed() signal connected. When you run the project, it starts in Scene1.tscn. However, pressing the button does nothing. Now whenever we run any scene in the project, this script will always be loaded. Returning to the script, it needs to fetch the current scene in the _ready() function. 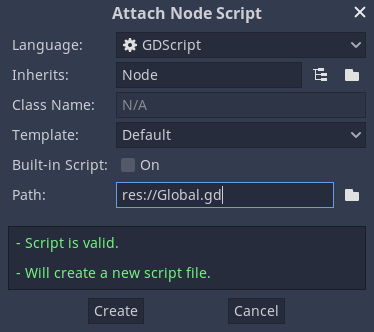 Both the current scene (the one with the button) and global.gd are children of root, but autoloaded nodes are always first. This means that the last child of root is always the loaded scene. Now we need a function for changing the scene. This function needs to free the current scene and replace it with the requested one. # or some other function in the current scene. # a bad idea, because it may still be executing code. # This will result in a crash or unexpected behavior. # Load the new scene. # Instance the new scene. # Add it to the active scene, as child of root. # Optionally, to make it compatible with the SceneTree.change_scene() API. // or some other function from the current scene. // a bad idea, because it may still be executing code. // This will result in a crash or unexpected behavior. // Load a new scene. // Instance the new scene. // Add it to the active scene, as child of root. // Optionally, to make it compatible with the SceneTree.change_scene() API. Using Object.call_deferred(), the second function will only run once all code from the current scene has completed. Thus, the current scene will not be removed while it is still being used (i.e. its code is still running). Run the project and test that you can switch between scenes by pressing the button.